The ultimate gift-giving season is upon us and with that, all the stress that it can bring. 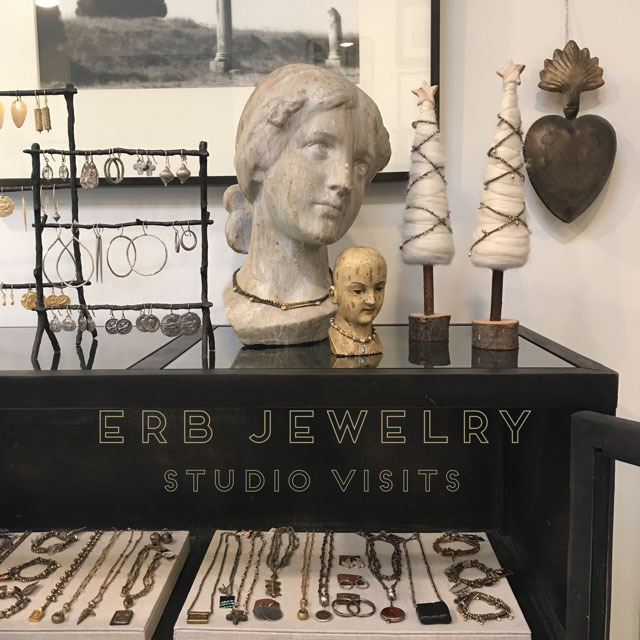 For a relaxed shopping experience, perusing through my entire collection of ERB Jewelry, why not make a date for a studio visit? You can take your time picking out just the right thing for that special someone, even if that special someone is you. I look forward to hearing from you and making your gift-giving season all the better. It is no mystery to many of you who know me well that I love textiles. That is why I am so excited to announce that ERB Jewelry will be at Raoul Textiles in Santa Barbara with my dear friend, Christine Love Adcock, designer and maker of exquisite baskets. We will have all our best seasonal wares available for your holiday shopping. Right on the corner of State and Yanonali Streets, Raoul Textiles is at the entrance of the trendy Funk Zone in Santa Barbara. Come by on Friday, Dec. 2nd from 10-7 to shop the most unique and artful goods made by hand in Santa Barbara. Enjoy the festivities of the Funk Zone Art Walk, a nice lunch or dinner at one of the fabulous neighborhood restaurants, or a stroll along the Santa Barbara Urban Wine trail, while you're at it. Support local artisans, small businesses and our treasured local culture as you kick off this holiday season. I just got back from my travels to the heart of Mexico, San Miguel de Allende. I was invited along with two fashion designers from Mexico City, 1/8 Takamura and Carla Fernández, to have a trunk show at Mixta, my favorite shop in town. I was happy to see friends, old and new, who have been picking up their ERB Jewelry at Mixta over the years, drop by to add one more piece to their collection. We will likely be doing this again, it was so fun, so will keep you posted. I am so thrilled to be back at Folly Home for their summer Makers Market. I hope you'll come by Carpinteria's most charming vintage shop to see me and all the fabulous vendors who will be there on July 30th from 11-4. There's just one more week for the much anticipated Homespun Artisan Showcase at Dos Pueblos Orchid Ranch along the Gaviota Coast just north of Santa Barbara. Join me along with 40 other makers for the shopping event of the season on Saturday, April 23, 11-5. 301 La Casa Grande Circle, Goleta, CA 93117.
at beautiful Dos Pueblos Orchid on the Gaviota Coast. Join ERB Jewelry along with 40 other amazing makers of beautiful wares along the beautiful Gaviota Coast. Or if you just can't wait, you can always shop online at erb-jewelry.com or book a studio visit by calling me at 805/705-1802. See you soon! Hello everyone! Now's the time to stock up on all the ERB Jewelry you've been eyeing. Use the coupon code JanuarySale at checkout when you order online, or drop me a line to set up a studio visit at erin@erb-jewelry.com before January 25. I look forward to seeing you. at beautiful Dos Pueblos Orchid on the Gaviota Coast just north of Santa Barbara. ERB Jewelry will be there with over 40 of the best artisans from near and far. Approximately 15 minutes north of SB, just past the Bacara and next door to DP Ranch. 101 N – Exit Dos Pueblos Canyon Rd. Travel approximately 1/4 mi. until you see the greenhouses. Remember, if you can't make it to the Homespun Artisan Showcase this Saturday, you can always shop ERB online or book a Studio Visit by calling me at 805/705-1802. But I hope you'll travel off the beaten path to discover the coolest shopping experience of the season. And be sure to tell your friends! and ERB Jewelry will be there with the best artisans from near and far. I hope to see you there, but if you just can't wait to get your hands on some ERB Jewelry, you can always Shop Online, or book a StudioVisit by calling 805/705-1802. But, I hope you'll come by. Ten unforgettable Summer days in the City of Light have me brimming with inspiration. Yes, I'm back at work in my Santa Barbara studio, but I can't seem to give up on the joie de vivre. What a delight to be out and about at all hours of the day and night and seeing people enjoying life along the River Seine, at charming cafes and in lush gardens. The thing I love about the French is that there is no detail too small or too large to imbue with grace and beauty. No matter if it's the simple way your sandwich is wrapped at the bakery, the way the light comes in through the louvres of the apartment, the flow of the scarf on a woman's neck as she strides down the street or the grandeur of the many monuments that are so carefully placed all over the city so they can be appreciated from near and far, everything is deliberately well designed and a thing of beauty. I try to keep that in mind when I sit down to work in my studio, combining old materials with new, elements from near and far, things made thoughtfully by hand with the intent to endure. I look forward to sharing with you my new pieces as all this inspiration turns into beautiful jewelry. Do give a call to set up a studio visit (805/705-1802), shop my website (erb-jewelry.com), browse my ERB Jewelry photos on Facebook or my ERBpics on Instagram to stay in touch. As the big day approaches, I'm flooded with memories of Mothers young and old, and how much our world revolves around them and because of them. In memory of my own dear Mother, her Mother, and to celebrate my daughter who has given me the joy of being hers, I'd like to extend to all of you a 20% discount on everything in stock. Treat your favorite Mother or yourself to a little something special to celebrate. Simply enter the coupon code MOM20 at checkout to receive the discount. Or to schedule a studio visit between now and Wednesday, May 6th, please call me at 805-705-1802. As many of you may know, Africa Schools of Kenya is an organization near and dear to my heart. Founded by my good friend Teri Gabrielsen, ASKenya's mission is to enrich the lives of the Maasai people by facilitating the development and implementation of educational programs, while respecting their traditions and cultural way of life. ASKenya is conducting a book drive for the Esiteti School in Kenya and ERB Jewelry is joining Crane Country Day School, Cold Spring School, Loma Vista and Chaparral Elementary schools in raising funds for this worthy cause. ERB Jewelry is donating 20% of all sales through March 15 to Africa Schools of Kenya, in your name. I invite you and your friends to visit my Santa Barbara studio or my website to shop my collection. Just mention this email or use the coupon code "Beads for Books" at check out and 20% of your purchase will go to ASKenya. To make a studio appointment, please call 805-705-1802, or email me. After many months of drought in California, we seem to be enjoying a little respite with the very welcome occasional rain to bring everything back to life. Many of us have altered our landscapes, incorporating succulents and cactus to get through these dry times, learning from them how to live and flourish with less. I am inspired by their graphic beauty and can't seem to get enough of their many shades of green. Turquoise, moss aquamarine and green-grey labradorite are some of my favorite stones to work with and I love how they mix with old and new brass, silver oxidized to various degrees, and the occasional touch of vermeil. In the coming weeks I'll be adding more pieces to my collection which I hope you will enjoy and want to add to your personal mix. And for all of you who are still experiencing the depths of winter, I hope a little taste of all this lush green will get you through until Spring arrives. My aesthetic has evolved over the years to reflect such an eclectic mix, thanks to all the fabulous people who collect my pieces. Your enthusiasm for unique, handmade jewelry continues to inspire me. Designed to be combined with your own treasured pieces, I strive to reinvent ways of using the materials I gather—old and new—from all over the world. Meant to be worn freely instead of being relegated to the jewelry box, your ERB lives an exciting life because of you. To see these and other photos, follow ERBpics on Instagram or like ERB Jewelry on Facebook. Even better, send me a fabulous photo, to share. I look forward to seeing how you wear your ERB Jewelry! Nothing is more renewing than planting your feet in the sand and having the waves wash over you as you take in a deep breath of sea air. The ever-changing colors of the sand, sea and sky bring a calm over me I long to bring home every time I go to the beach. A recent trip to the island of Nantucket was a trip down memory lane for me, as I used to go there often, back in the day. Long walks on Madaket beach collecting treasures, taking in the exquisite crafts created by sailors at the Nantucket Whaling Museum, visiting the beautiful shops along the waterfront, all made me want to get into my studio and create pieces that captured that unique windswept island flavor. I love working with stones, shells, glass and metals that evoke that feeling. Aquamarine, Peruvian opals, conch shells, quartz and vintage glass African trade beads all come together in this collection of pieces that are as light as an ocean breeze. Whether it’s the end of Summer and you want to hang on to that feeling just a little bit longer, or it’s the dead of winter and you want to be transported, I hope you’ll peruse these beauties and enjoy.